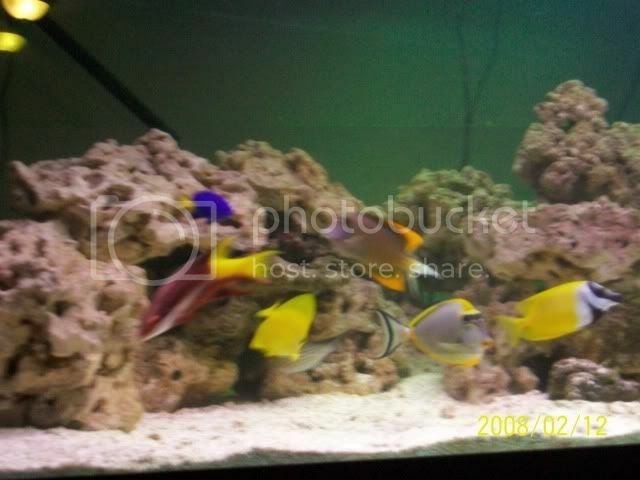 Current Livestock: 2 Yellow Tail Damsels, Yellow Tang, Tomini Tang, Blonde Naso Tang, Clown Tang, Foxface, Cuban Hogfish, Red Squirellfish, Clarki Clown. No pics today, but an update. 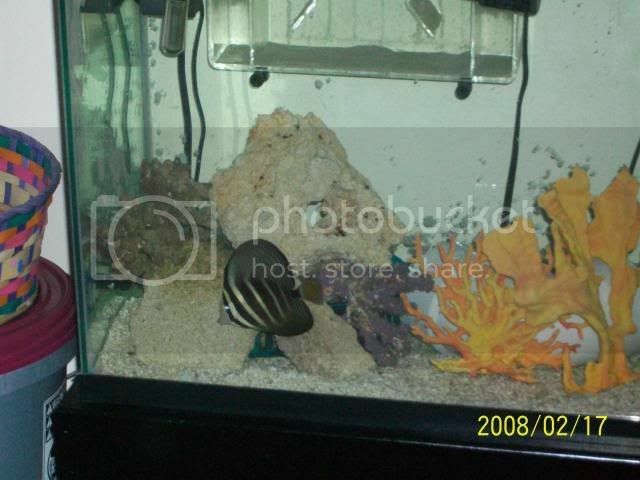 I moved the Sailfin Tang into the display without incident. 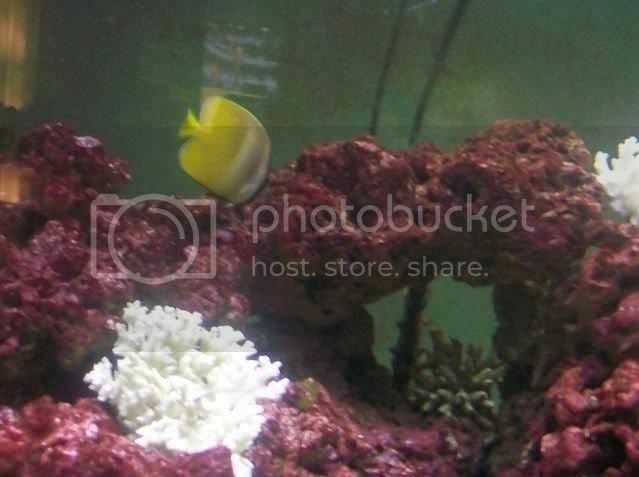 I was surprised that the Yellow Tang ignored his presence, perhaps because the Sailfin is considerably larger. 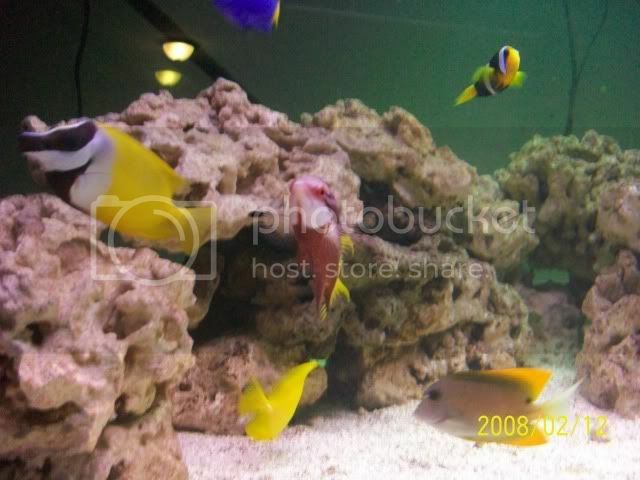 I added a Blue Girdled (Majestic) Angel and a Scopas Tang to my Q tank. 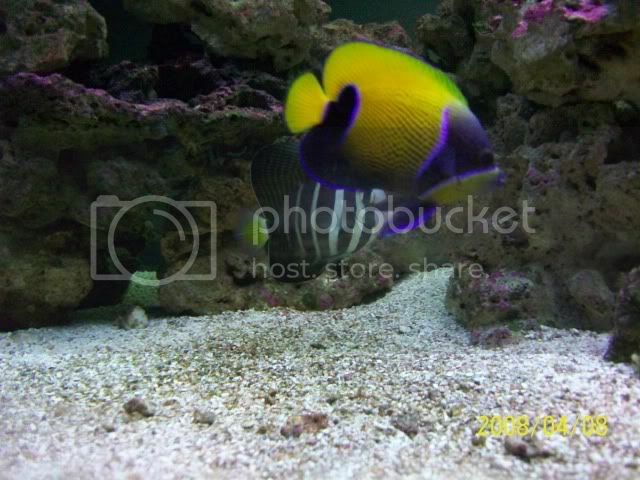 Wow, this Scopas is a beautiful fish. I have never cared for the Scopas, but this particular one is incredible. I will post pics when I get some good shots. Params: 8.2-8.3pH, 12dkh alk, 440ppm calcium, 5ppm nitrate, 78F, 1.024. 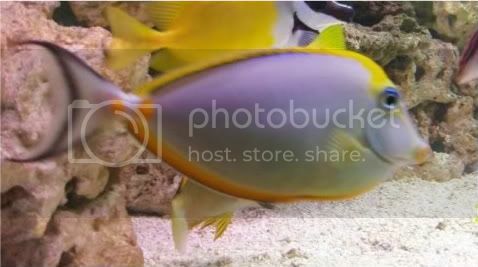 Current stocking list: 2 Yellow Tail Damsels, Clarkii Clown, Cuban Hogfish, Red Squirrelfish, Majestic Angel (Blue Girdled), Yellow Tang, Scopas Tang, Sailfin Tang (Z. veliferum), Blond Naso Tang, Tomini Tang, Clown Tang. 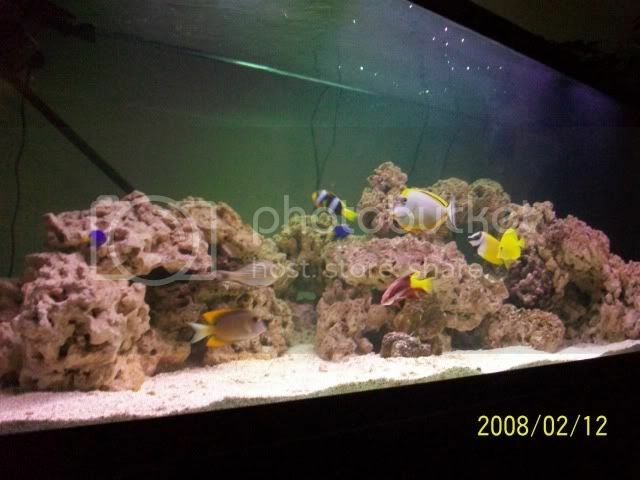 Here is an updated pic from my 54 bowfront reef. I purchased this Green Leather in April of 2008. At the time it was smaller than my thumb, and actually was just attached to a piece of live rock. Today, when fully open it is nearly as large as a computer monitor. It has been a long time, so here are some updated pics of the 180. WOW! I love it! Is it the same stocking? Have you lost any fish? 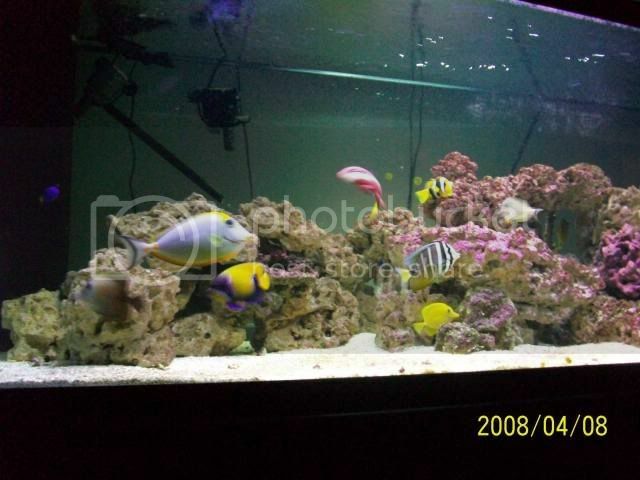 I would love to set-up a reef aquarium since I have a pH of around 8.2 out of the tap so it would be easy (well, not that easy) to set-up one, but then again...I have only been in the hobby for around 1 year. I have had 2 incidental losses. The first was one of the 2 Yellow Tail Damsels, which eventually became bit size and was made a meal of by the Cuban Hogfish. The other was the Red Squirrelfish, which had its eye bitten off at feeding time, again presumably by the Hogfish. Oddly enough, the Hog is a very peaceful fish in this tank, but at feeding time he is wild and out of control! By the way, I decided to make this a FOWLR. 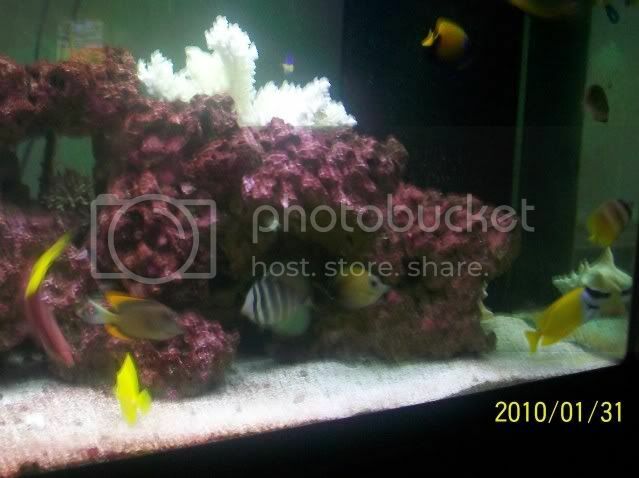 My 54 reef is keeping me happy enough on the reef side, and I really wanted to load this tank with fish. Disclosure: Do not try this at home, I have a screw missing in my head and overstock my tanks. Actually, although things may look crazy busy in this tank, each fish was picked very carefully based on years of experience to ensure its behavior would mix in with the other fish. 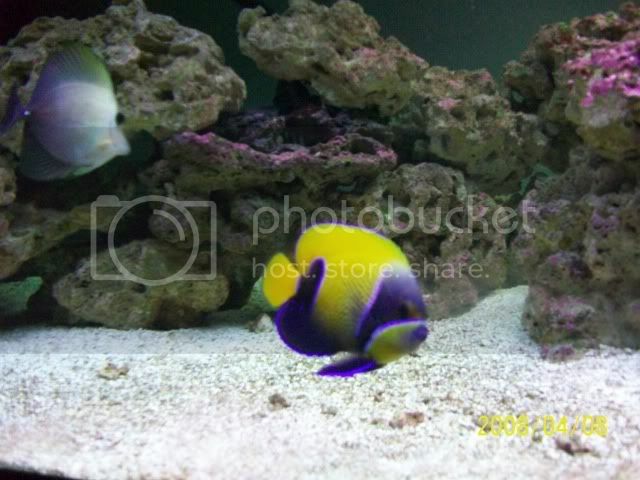 The only aggression I see is the occasional muscle flexing from the Clown Tang, which I may eventually have to remove. These will probably be my last additions, unless I decide to add a Pasfur Angel, which may happen if I ever see one available again. 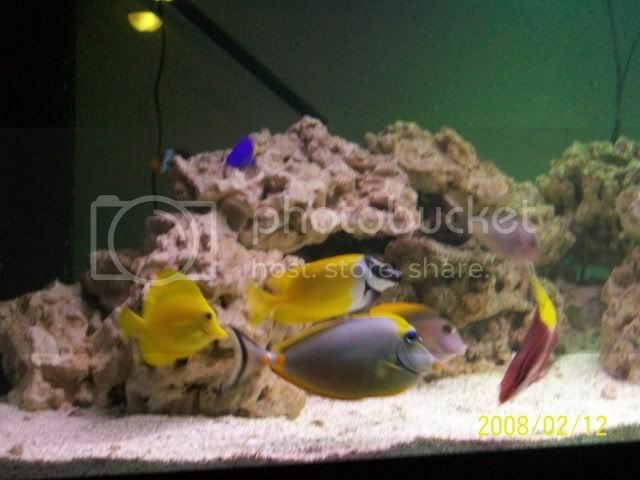 I also feed the tank very heavily and have a lot of rock work for night time resting places, which is the reason I believe I am able to stock so many fish without constant bickering. 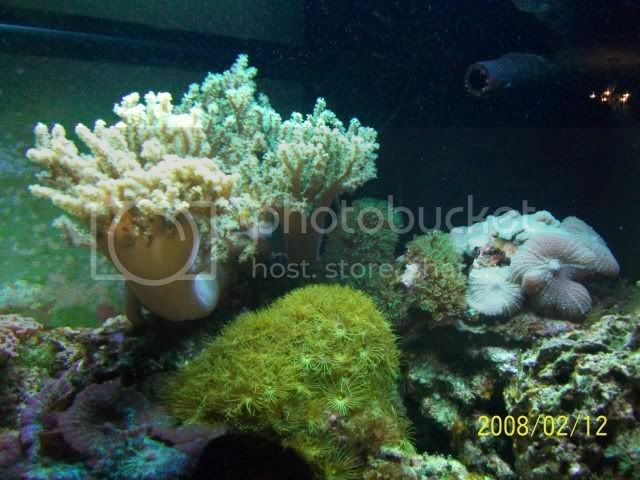 I think most tanks are way underfed and under aquascapped. Anyhow, glad you enjoyed. 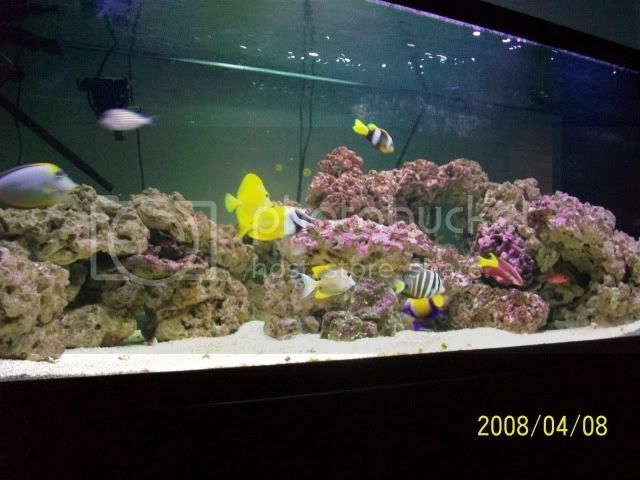 Don't hesitate to do a marine tank. They don't have to be overly expensive and they are so easy to care for IF YOU TAKE YOUR TIME and do it right. Yeah, I have a filter, heater, and tank. I guess I would need salt and I am confused on the protein skimmer debate, some say get a filter, some say get a protein skimmer and some say get both, I'm confused what would you reccomend for a 30g? There is no debate. The debate starting around 1990 and ended long before we turned the century. What possible points could anyone make to defend using a filter, as opposed to a skimmer? Lets look at the obvious. Every filter on the market is designed to do a few things, and to do them well. This applies to canister filters, biowheels, hang on filter, wet dry filters, and practically every filter ever made in this hobby before protein skimmers became popular. First, they break down organic wastes with an end product of Nitrate. This is not a good thing. 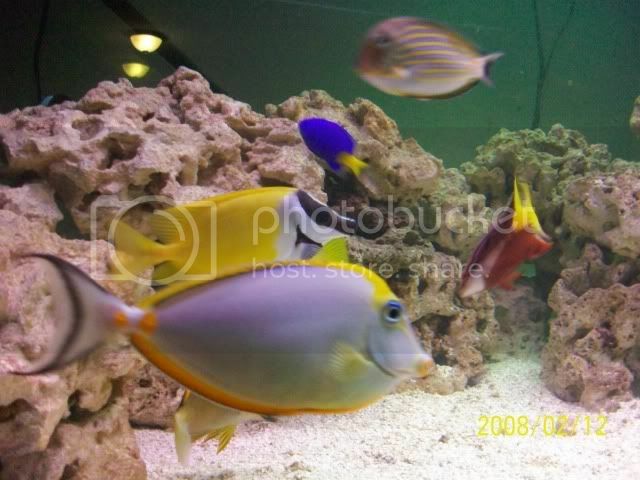 We don't want nitrate in a marine tank. The alternative is a skimmer, which REMOVES organic waste without breaking it down. This is good. Second, all of these filters do one thing during the process of metabolizing organic waste. They deplete carbonates. Carbonates are what make up your buffer system. Removing carbonates makes it more difficult to stabilize alkalinity and calcium, resulting in wider pH swings and greater stress to livestock. On the flip side, the protein skimmer removes the organic ACIDS directly from the water, helping to stabilize the carbonate buffer system. What about the negative impact of protein skimming you ask? Great question. There were wide spread rumors when skimmers first hit the market that they might remove trace elements that are needed for coral growth. Study after study has shown this not to be the case. Plus, it is pretty obvious the impact skimming has had when you look at the growth of the coral hobby and the number of corals being propagated successfully by the casual home hobbyist. The livestock is telling us that skimming works and that the animals are NOT lacking for trace elements. On the flip side, if you look at the negative side effects of biological filtration, you will find many. In addition to the already mentioned Nitrate buildup and carbonate depletion, you also have detritus accumulation and phosphate spikes. Not to mention the dreaded "wipe out" that no longer exists in this hobby because we STOPPED using filtration methods that were intended for freshwater aquariums. Skimmers are efficient, easy to maintain, inexpensive, and make it possible for the home hobbyist to keep a marine aquarium with very little physical effort. The key is live rock, aragonite sand, and careful testing of alkalinity and calcium. In many ways we run the modern marine aquarium like a low tech freshwater live plant tank.